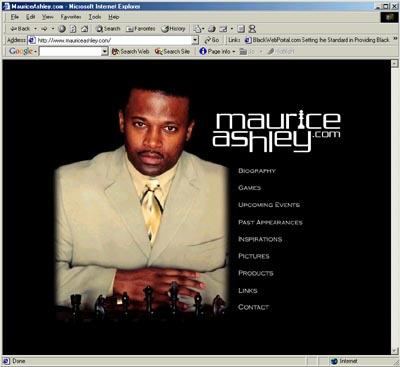 GM Maurice Ashley launches MauriceAshley.com! GM Maurice Ashley has served the chess world for the past decade with his gracious service to the inner-city of New York and to the chess world at large. Since the dissolution of the Harlem Chess Center (due to budget cuts by HEAF), the Brooklyn-based GM has now extended his reach to the globe with "MauriceAshley.com." This handsome website features a variety of information including a brief biography, game archive, a picture gallery, and even some of his personal inspirations. GM Ashley is reassuring when stating that the ever-popular Harlem Chess Festival will go on as advertised. Perhaps MauriceAshley.com will open up new opportunities for bigger and greater things to come. To check out MauriceAshley.com, click below!